Universal tooth profile drops into existing HTD sprockets. Fiberglass tension cords for excellent resistance to shrinkage and elongation. 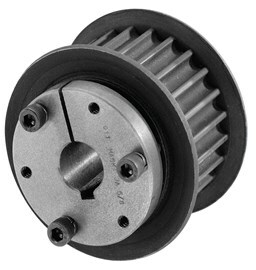 E Inch Bushings Required or E Metric Bushings Required for these pulleys and for matching belt see Axiail Fan Pd® Belts section for these pulleys. If you need help Contact Us.